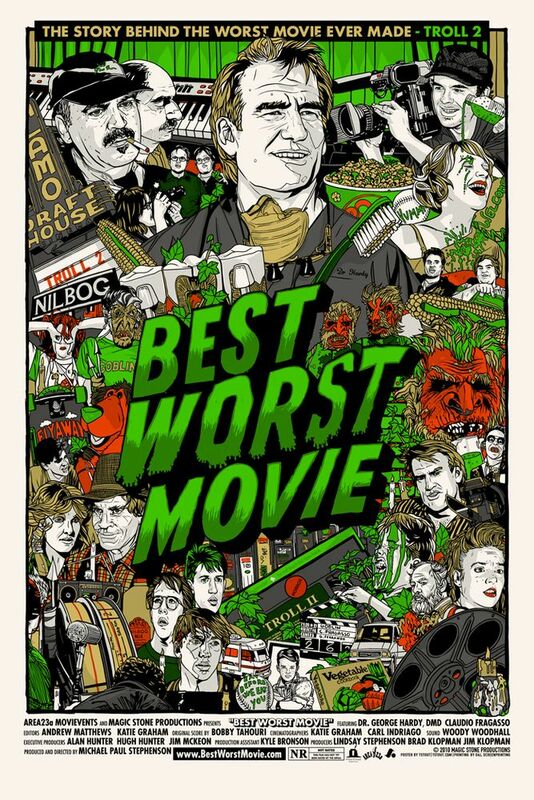 If you’re a fan of Troll 2— a film generally agreed to be amongst the worst films ever made—then there’s a good chance you’re familiar with the 2010 documentary Best Worst Movie. 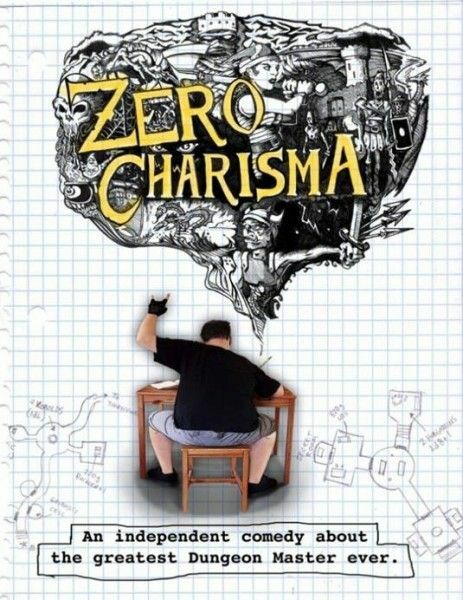 That doc (about the making and aftermath of Troll 2) earned rave reviews and ended up on a number of top ten lists the year it was released, and now the creative team behind that film has regrouped on a new indie project: Zero Charisma. 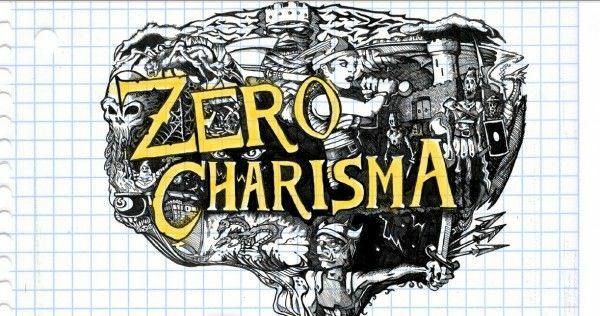 Last week, I visited the Zero Charisma set to chat with Andrew Matthews, Katie Graham, Michael Stephenson, and the film’s star, Sam Eidson, to find out more about their latest collaboration. Wanna know what they had to say, and how these guys came to be working together in the first place? Meet me after the jump, folks: all will be revealed. 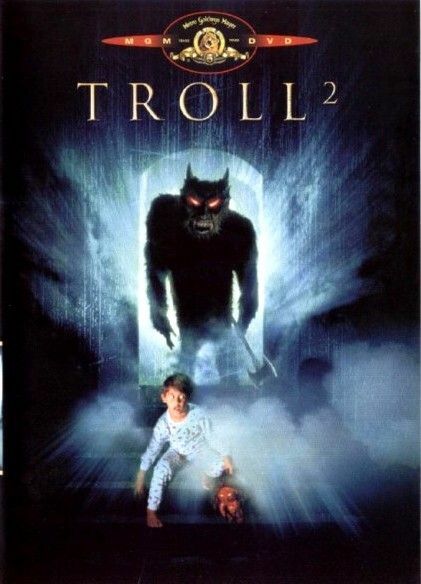 Long before Troll 2 had become the massive cult hit that it is today, Andrew Matthews and Katie Graham believed—as so many of us did back then—that they were pretty much the only people who knew about Claudio Fragasso’s monumentally bad movie. Back then (in the days before Google, when fans couldn’t connect as easily as they do today), Graham and Matthews hosted viewing parties for friends who’d never seen the film, and quickly got to a point where they could recite big chunks of the film’s cringe-worthy dialogue as it was delivered onscreen: they knew Troll 2 backwards and forwards, but neither really expected that knowledge to amount to much. And then, one day, Matthews—an editor by trade—decided to put together a little video using clips from the film, primarily for the amusement of the other Troll 2 fans he’d met online. He spent an afternoon putting the video together, uploaded it, and wandered away from the computer hoping that his fellow Troll 2 enthusiasts might get a kick out of it. As expected, the clip was a minor hit amongst the Troll 2 faithful. What Matthews might not have expected, however, was that the clip would end in front of Michael Stephenson, the grown man who—two decades prior– had starred as “Joshua” in the film. Stephenson wasn’t just amused by Matthews’ work, he was massively impressed, and soon enough he had tracked down the person responsible for editing the viral clip together. Graham, and Matthews became fast friends with Stephenson, who went on to tell the pair that he wanted to make a documentary about the aftermath of Troll 2: where were all those now? What did Fragasso think of the cult that had sprung up around his film? How did all those people end up starring in the “best worst movie” ever made, anyway? To their surprise, Stephenson went on to tell Graham and Matthews that he wanted their help: Katie would shoot the film, Michael would direct, and Andrew—whose editing skills had grabbed Stephenson’s attention in the first place–would handle editing on the doc. And so, thanks in no small part to their love for one of the most notoriously awful films ever made, Matthews and Graham had somehow managed to Forrest Gump their way straight into a career in the film industry. Admittedly, the whole thing’s almost hard to believe, but it actually gets crazier: the trio’s documentary, Best Worst Movie, ended up with a 95% on RottenTomatoes, won “Best Documentary” at the Fantasia Film Festival, and earned over $100,000 at the box office on an extremely limited budget. So, not only did Matthews and Graham basically stumble into their film career, but they also made a helluva first impression. It’s been a few years since Best Worst Movie arrived, and–in the time since– Matthews and Graham moved to Austin, wrote their own script—a narrative comedy titled Zero Charisma, set in the world of Dungeons and Dragons-playing nerds —started an IndieGoGo campaign to fund the project’s pre-production stage (they quickly raised their $25,000 goal, thanks in no small part to the faux-trailer that circulated to advertise the campaign; that’s located below), and—over the past few months—the two have been hard at work securing all the actors, crew members, and locations necessary to roll film. Talking to them, you can tell they’ve been under quite a bit of pressure, but luckily they’ve got a familiar face on hand to handle some of the work: just before shooting started earlier this month, it was announced that the pair had hired their former Best Worst Movie co-worker, Michael Stephenson (and his wife, Lindsay, who’s also handling publicity for the flick), to serve as the film’s executive producer. 9. Says Matthews in regards to the film’s main character, Scott, played by Sam Eidson: “We wanted to see a leading man who wasn’t young, attractive, and hip. We feel like there’s enough of that. Or the one normal guy where everyone around him is wacky—ugh. It’s more interesting to have the lead be the most interesting guy in the movie, and that’s what we were going for when writing (Sam Eidson’s character). This character is a really popular archetype, but you rarely get to see why he is the way he is, or what his life is really like. 2. 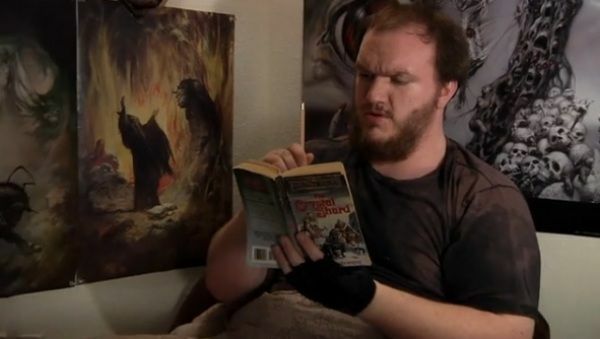 Matthews calls Eidson’s character a “luddite nerd”, and says we won’t be seeing Scott playing an XBOX, World of Warcraft, or any other sort of electronic-based game. 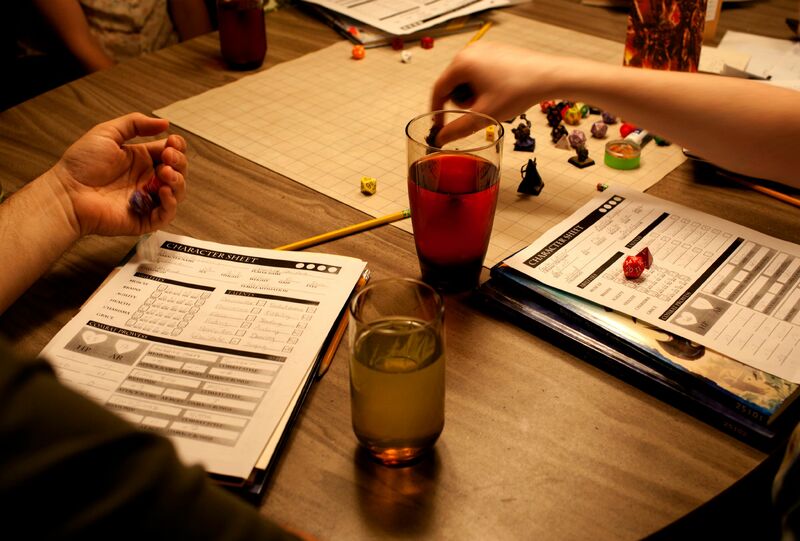 For anyone that was wondering just how focused Zero Charisma might be on the D&D aspect of these nerds’ lives, that oughtta tell you everything you need to know: “Paper, pencils, figures…no electronics”. 1. And, finally (by the way, these aren’t in any particular order, so don’t expect this entry to be super-awesome just because it’s in the #1 spot), here’s something interesting about the set we were on: When it came time to find a location for the lead character’s home—which needed a living room, a bedroom, a kitchen, and a dining room big enough to hold a large table occupied by D&D nerds—Matthews and Graham looked all over town for something that’d fit the bill. After searching for weeks, they finally remembered that the house immediately behind theirs has long been empty, neither for sale nor occupied. They got ahold of the owner, got inside, and discovered that the main location they’d been looking for over the past few weeks…was right behind them the entire time. And so, Graham and Matthews have set up inside the home behind their own. The walls have been painted and the furniture, decorations, and clothing you’ll see was all brought in just for the film, and Scott’s bedroom in particular is…well, it’s something to behold. 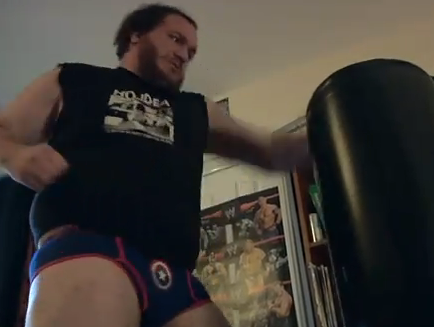 Oh, and when you watch the film, pay close attention to the walls in Scott’s bedroom; you might see a wrestling calendar the crew had mocked up for the film, and you might just recognize the face of the sweaty, muscle-bound wrestler pictured on said calendar (hint: he’s a friend of the Alamo Drafthouse and Stephenson’s production company). As I mentioned before, you can check out the Zero Charisma fundraising trailer at the bottom of this page (note: none of the footage seen in this trailer will appear in the final film, and many of the actors won’t be in there, either; this trailer was made simply to showcase the tone, style, and plot of the film that Matthews and Graham hoped to make), and you can stay tuned for more on the film as we get closer to the film’s release: we’ll have more updates, more footage, more interviews and, uh, more in the weeks ahead, so stay tuned. And—as always—you can feel free to hit the comments section below if you’ve got anything you’d like to say here. Looking forward to the flick? Think the main character might be based on you or someone you know? 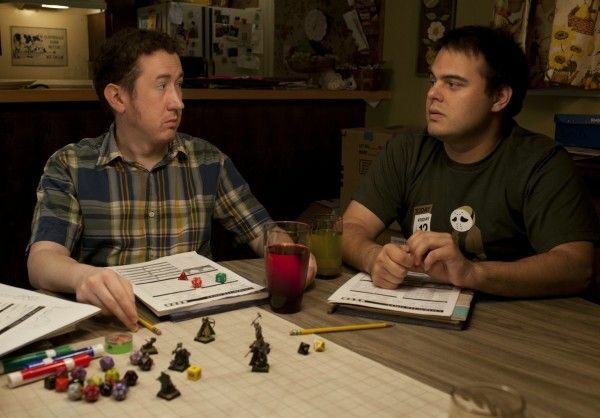 Are you a D&D fan that fears the mockery this film might level at you? Sound off below, folks: we wanna know what you’ve got to say about all this!